Google recently came out with a new tool to help companies compare their mobile performance against their competitors and measure the impact that decreasing mobile page load times can have on revenue. It’s not surprising to anyone in the marketing world that the results are significant. Users are increasingly demanding of websites to load as fast as possible, with slower websites experiencing noticeable increases in bounce rate as well as drops in other engagement metrics like time on site, pages per session and event/goal completions. This move by Google is the latest in a series of initiatives by the tech giant to emphasize the increasing importance of mobile experience in the modern internet landscape. Looking back to April 2015, Google updated their algorithm in a release dubbed by webmasters as “Mobilegeddon”, giving priority in their SERP rankings to mobile- and tablet-friendly websites when the query was made on a mobile device. In May of that same year, they released a statement saying that mobile searches exceeded those of desktop in 10 countries, including the US & Japan. In November 2016, they started experimenting with mobile-first indexing, wherein a site’s mobile version, if it had one, would be used as its primary version, with the desktop version being displayed only if a mobile version was not available. Those sites without a mobile version would most likely see a decline in their SERP rankings while sites with a mobile-friendly experience could receive a boost in rankings regardless of the device on which the search is being made. Fast-forward to January 2018, Google released a statement explicitly calling out the fact that page speed will now be a ranking factor on mobile searches like it has been on desktop starting in July of this year. One question you may be having is why Google is taking such a strong stance on mobile. The answer is multi-faceted, but it all comes down to providing users with the best possible experience, which ultimately benefits both users and Google. By optimizing your site for a mobile user, using techniques such as responsive design, fast page load times, utilizing caching and providing high quality content, your site is more likely to be engaging to users and therefore rank higher on Google’s SERP. Google benefits by providing users with the highest-quality content in the top positions which builds trust and makes users more likely to use them in the future, while you benefit with increased website traffic, higher conversion rates, and more engagement with your site. It’s in Google’s best interest to keep this feedback loop continuing and to get webmasters to perpetually try to optimize their sites for an optimal user experience, which is why we’ve seen this progression from merely stating that mobile experience is important to announcing to the world that it is definitively a factor in their rankings and providing businesses withtools like the Impact Calculator that should encourage them to make strides in the short term to that effect. Back to Google’s new mobile tools for a second. 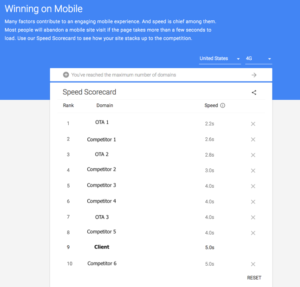 The top section of the page allows you to compare your site with those of your competitors to see how your mobile speed stacks up. This is a great tool for benchmarking and assessing if you’re currently ahead of, in line with, or way behind your competition. In the below example, we would recommend to our client that they make immediate changes to their website to get on level terms with their competition as they are lagging behind all but one of their competitors. 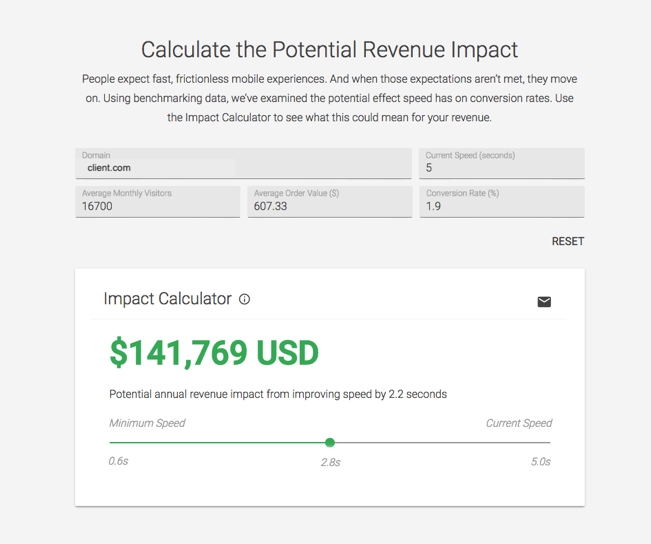 Revenue Directors and business owners will most likely be more intrigued by the Impact Calculator, though. It will ask you for data regarding average monthly website visitors, average order value, and website conversion rate. Based on this information, it will give an estimate of how much incremental revenue can be generated by lowering your site’s mobile page load time on a scale in increments of 0.1 seconds from your site’s current load time down to their minimum threshold of 0.6 seconds. As you can see from the graphs, incremental revenue starts to increase exponentially as page load times approach the minimum of 0.6 seconds. While that minimum isn’t currently attainable for many websites, it’s certainly something everyone should be striving for given the potential payoff. 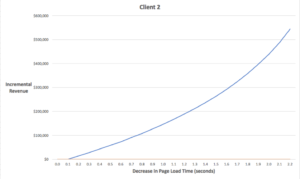 The nice thing about decreasing page load times is that it positively affects other metrics that you may not have thought about. It’s obvious that bounce rate would decrease while time on site and pages per session would increase, but could this affect organic search results, too? While no one knows exactly what’s in Google’s search algorithm, we already know that they have come out and said that site speed is a ranking factor and that mobile page load speed will be a ranking factor starting in July. It’s also been shown through independent testing that the top positions in organic search results typically have lower than average bounce rates and higher than average time spent on that page. By increasing your mobile site speed, you’re helping your site’s pages rank better for organic results, thereby supplementing your other SEO efforts. As mentioned previously, higher organic rankings should produce higher website conversion rates and therefore more revenue, something every business owner can get behind. WHY IS THIS IMPORTANT FOR HOTEL WEBSITES? You may be thinking that this all sounds great but it’s not currently a priority, and you’d rather focus budget and time on channels with predictable ROIs. The thing about that is, you’re wrong. Mobile traffic is increasing every year and has accounted for the majority of worldwide searches since 2015. Most of your users are most likely on mobile devices or will be in the near future. Also, in preparing for Google’s eventual worldwide switch to a mobile-first index, it’s even more important to have a mobile-friendly website and for mobile page load times to be lower, since a domain’s mobile site will be used as the primary site in Google’s search results. They are making it clear with their actions that this is the direction they want websites to move towards, with those who don’t comply being penalized and pushed further down the SERP, never to be seen again. It’s in your best interest to take the necessary steps to optimize your site for mobile now, and make a concerted effort to keep it that way moving forward. Mobile traffic and faster speeds are the future. Get in touch with us today if you’d like more information on how GCommerce can help you gain incremental revenue from increased mobile site speed and optimize your site for a mobile experience.